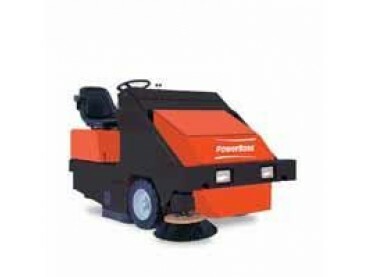 The Collector series of industrial floor sweepers are ideal for shopping centers, warehouses, outdoor cleanup, manufacturing facilities and other establishments that require outstanding sweeping performance. 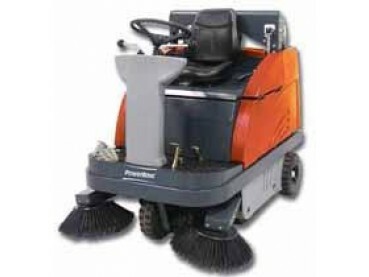 Product features include a large main broom that boosts sweeping capacity and performance, a large side broom overlap that is helpful for negotiating tough corners and a powerful dust filter with an aggressive filter shaker. The Collector series also features a robust, heavy duty steel frame that will withstand years of regular use, durable covers that protect the engine, battery and debris hoppers, a parking brake that increases safety due to its automatic release upon starting and an ergonomic self-propelled traction drive system that makes operations a breeze. The innovative overthrow sweeping system achieves 100 percent hopper capacity, and the quiet gasoline engine enables you to clean anytime without interrupting daily operations. 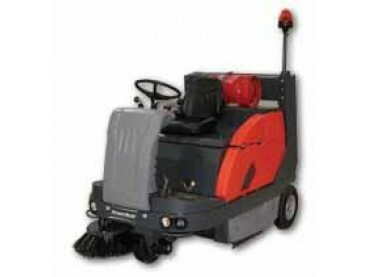 The Apex 47 Rider Sweeper is designed for heavy-duty industrial use. It is constructed on a steel frame and the panels, made of synthetic material, are virtually indestructible. With a 90-90 turning radius, the Apex 47 is extremely maneuverable as a result of the directly steered front wheel drive. It is easy to operate even in the narrowest of aisles. The Apex 47 provides perfect sweeping results due to the large, newly developed main broom with compensation for wear and tear. This rider sweeper is available in gas, propane, or battery and with a choice of hydraulic high- dump or manual low-dump hopper. The engine and battery compartments are clearly laid out and directly accessible for maintenance and servicing purposes. The seat console simply tilts backward to reveal these compartments. The seat is also equipped with a safety shut-off switch, if the operator gets up from the seat, the machine will shut down. This ride on sweeper is ideal for any outdoor or indoor sweeping job and has excellent climbing ability thanks to its powerful drive. The Apex series of machines are capable of long run times of up to 10 hours for the LPG, gas and diesel models and up to 3 hours for the battery model. 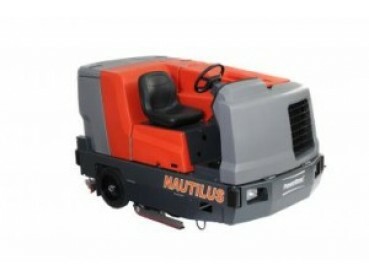 This series also features large wheels that keep the driver comfortable on uneven surfaces and allow effortless mounting of curbs, large coarse dirt flaps that pickup even large items like wood and stones, and a 60-inch high dump hopper that makes emptying debris into larger containers simple. 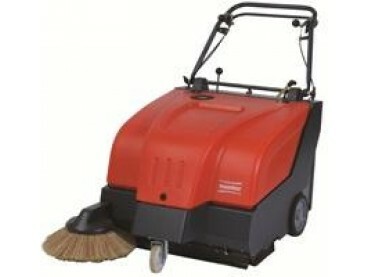 The Armadillo 9X and 9XR are cost-effective models that feature hopper capacities of up to 1,500 pound, 48-inch main brooms, 24-inch side brooms and cleaning widths of 62 inches. 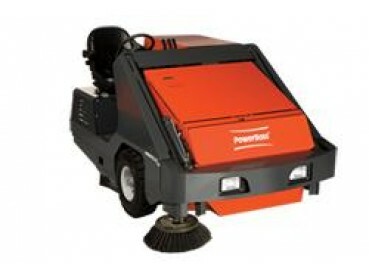 These powerful ride on sweepers are capable of cleaning up to 184,800 square feet per hour. 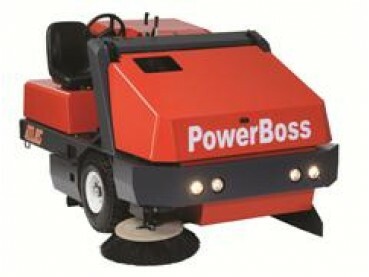 The Armadillo 10x ride on sweeper from Powerboss offers the ideal combination of quality, affordability and power. 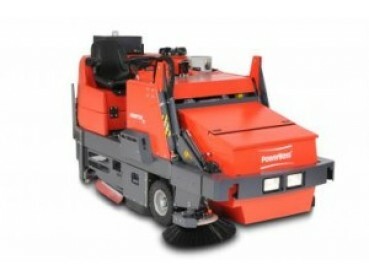 Manufactured to meet even the most rigorous cleaning requirements, this heavy-duty machine providers a longer lifespan that most other conventional sweepers and is capable of cleaning 217, 800 square feet per hour. This exceptional ride on sweeper offers unmatched engine accessibility, which saves maintenance times and provides for a longer engine life. The Atlas 64 comes complete with the Safety Vision Dumping System, which allows the operator to easily and safely dispose of debris at heights up to 60 inches, and the hopper also features an opening for debris that should not be swept, giving the operator a place to easily deposit materials that may otherwise be left behind. 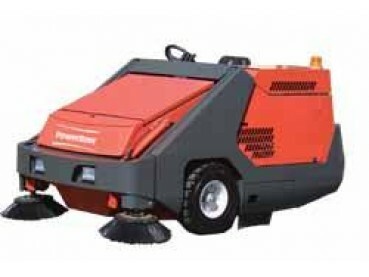 Other remarkable features include a safety vision dump window, power control dust collection system, heavy duty design and exceptional ground clearance that makes it easy to sweep medians and sidewalks without damage the ride on sweeper. 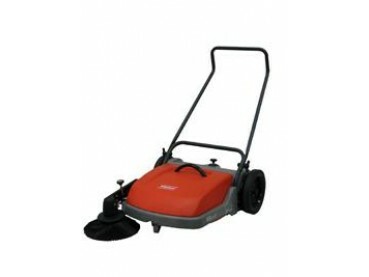 Combination sweeper/scrubbers are the ultimate solution in efficiency. The Commander T82 is a total sweeper/scrubber, giving the operator the ability to hydraulically high dump heavy debris while aggressively scrubbing. This combination sweeper/scrubber features a quick load hopper that moves effortlessly thanks to Easy Roll Casters, a quick view squeegee that allows for quick changes and an optional heavy-duty edge scrub that enables easy cleaning near rack rows and walls. 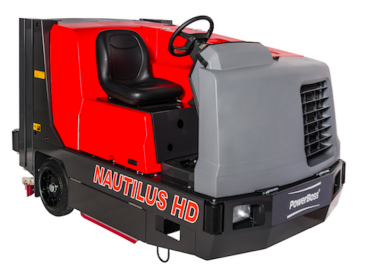 The Nautilus’ Quick Scrub feature allows the operator to turn on and off all functions with the flip of a switch and allows for easy changes in brush pressure and water flow while the machine is running.